Some 130 Camden UNISON members, employed by parking enforcement contractor NSL will launch a seven-day strike from Wednesday 23 September in an increasingly bitter dispute over pay and conditions with the industry’s biggest player. Civil Enforcement Officers (CEOs), organised by UNISON, walked out for four days earlier this month after overwhelmingly rejecting the company’s slightly revised offer in late August. The current strike action marks the second pay dispute on the Camden NSL contract in the past three years. The dispute now focuses on the basic hourly rate after NSL refused to negotiate around demands for improved occupational sick pay or the length of the working week, presently 42.5 hours. Following five days of action in 2012, a three-year settlement emerged that kept CEOs at an hourly rate marginally above the then rate for the London Living Wage (LLW). Basic pay now stands, however, at £8.92 an hour, 23 pence below the current LLW of £9.15, announced in November 2014 and implemented by employers committed to the LLW standard by April. Pay rates vary dramatically on London’s outsourced parking contracts with some CEOs in the capital making below £8.00 an hour, while unionised NSL employees in Kensington & Chelsea get a minimum of £9.31 an hour, in Ealing they receive a basic rate of at least £9.73 and in Waltham Forest the hourly rate tops £11.00. 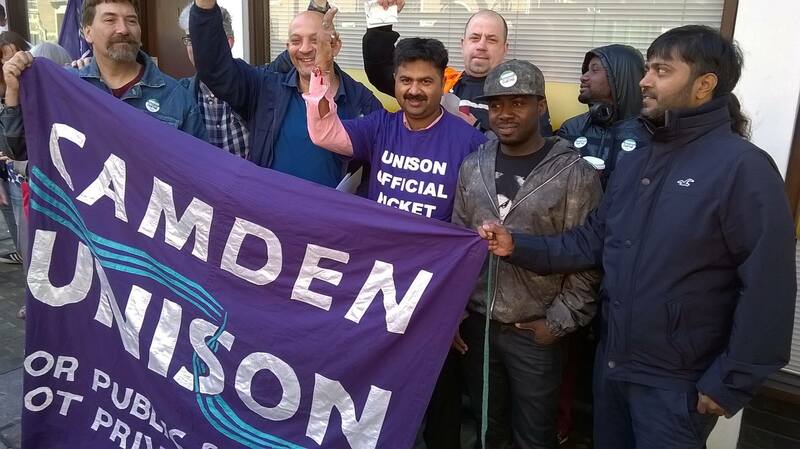 UNISON has argued that the parking enforcement contract, which last year generated some £24 million in ring-fenced revenue for Camden Council, should come back ‘in house’ with the workforce once again employed directly by the local authority. In the meantime, Mr Binette has called for ‘Camden Council to ensure that NSL feels serious renewed pressure through financial penalties’. Following early morning picket lines (locations detailed below), striking workers will stage a late morning protest on Thursday 24 September outside Camden Town Hall (Judd Street & Euston Road, WC1H 9JE), while on Friday the UNISON members will go to their union’s national HQ (UNISON Centre, 130 Euston Road, NW1 2AY) for photographs with Assistant General Secretaries, Bronwyn McKenna and Roger McKenzie between 11.30 and 12 noon. For further information, please contact George Binette, UNISON Branch Secretary, on the branch office number above or on 07557 563044/07905 826304. 3. The current London Living Wage (LLW) stands at £9.15 an hour, with an uprated figure to be announced in early November, calculated on behalf of the Greater London Assembly. While the LLW has not gained a statutory basis an increasing number of employers have agreed to pay it as the minimum hourly rate with supermarket chain, Lidl, becoming the latest to announce its commitment to LLW. Camden Council became an accredited LLW employer in autumn 2012, but did not make the policy retrospective. Camden had effectively offered to subsidise NSL to cover the full cost of both its previous offers of LLW and £9.15 (LLW) plus 12 pence an hour. • Regis Road, NW5 3EW- Car Pound & CEO Base, nearest Tube: Kentish Town.